iPass has staked its claim to most laptop and smartphone platforms with the introduction of enterprise iPhone and Nokia S60 clients on Tuesday, but the mobile network aggregator now aims to become a platform for other vendors’ services. The company’s user authentication, accounting and billing platform lets enterprises buy one account for access to many Wi-Fi, 3G, broadband and dial-up networks around the world. This simplifies the process of getting on the Internet for travelers and solves the problem of how to pay for that access at the enterprise level, according to President and CEO Evan Kaplan. Accounts are centrally managed by the enterprise. The company now wants to use the same back-end system as a platform for related applications, Kaplan said. This could leverage the client interface for easy access to applications and take advantage of a cloud-based back-end infrastructure to get those capabilities out to the user. There could be one virtual button for each application. The third parties wouldn't be using just the Internet connection but also the authentication and security mechanisms built into iPass, he said. Meanwhile, IT managers would be able to manage policies for all these third-party applications through the same back-end interface. The integrated functions might include collaboration, security and VoIP (voice over Internet Protocol), including an enterprise softphone application, Kaplan said. The providers of those tools might integrate them into iPass using an API (application programming interface), as do developers who work with Salesforce.com's AppExchange program. It’s a long-term vision, which Kaplan believes will take about two years to flesh out but could make iPass a more essential service for its core market of large enterprises. Today, the company differentiates itself through its relationships with a wide range of carriers and ISPs around the world, and it thrives on fragmentation, Kaplan said. That fragmentation among many types of networks is unlikely to go away tomorrow, but if ubiquitous Internet access from two or three service providers became a reality, iPass would have less to do for its customers. The iPhone and S60 clients, available now from the iPass Web site, let users of the iPass Mobile Office Service get on any iPass-supported Wi-Fi network and keep all the iPass settings they use with other devices. The iPhone software also works on Apple’s iPod touch. They won’t be charged extra for using the iPass service on more than one device, such as a smartphone and a laptop, in one month. The iPass Mobile Office Service provides a single connection experience across multiple devices, as well as giving IT managers control of users' Internet access, visibility into their use and a single invoice. Enterprises should feel more confident about allowing iPhones as work devices if users can connect the phones to the Internet using an existing enterprise account with security and policy settings, Kaplan said. S60 is the Symbian-based operating system for Nokia smartphones, which are widely used in Europe but less so in North America. iPass already had a client for Symbian. Next up is software for Research In Motion’s BlackBerry platform, coming this summer, Kaplan said. With that rollout, iPass software will be available for 90 percent of all smartphone operating systems, he said. Also on Tuesday, iPass is introducing a new client interface for Mac OS. Tuesday’s announcements and the new ecosystem initiative are both parts of a renewed focus on enterprises at iPass. 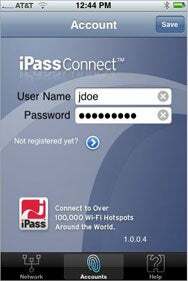 The company introduced the iPass Connect service plan for individual travelers in March 2008 but has backed away from the consumer business, said Kaplan, who took over iPass last November. Mobile operators aim their data plans mostly at consumers and serve them well, while they haven’t done a good job selling data services to enterprises, he said. The one exception is a consumer version of the iPhone client, which is already available from the App Store and is relatively easy to keep offering, he said. “What we’re trying to do is do everything we can to mate what we do to how the enterprise wants to buy. They don’t want to buy a two-year contract. They don’t want to buy equipment they have to keep tracking up,” Kaplan said. Because mobile operators now offer increasingly broad 3G connectivity and access to many Wi-Fi hotspots, the challenge for iPass is to differentiate itself, according to Kitty Weldon of Current Analysis. Although the company offers access to the largest set of hotspots, many users may be just as happy turning to their carriers for broadband on the road, she said. “Being the biggest can only get you so far,” Weldon said. One way iPass can set itself apart is through a tighter embrace of VoIP, which carriers are ambivalent about because it can eat into their sale of call minutes, Weldon said. Another is acting as an independent party between carriers and enterprises, managing mobility across many different networks. The plan to integrate third-party applications might play into this strategy, though it’s too early to say, she said. This role would particularly suit enterprises that take control of their employees’ mobile use instead of letting them set up their own accounts and reimbursing them, Weldon said. However, companies are still struggling with that notion, possibly unwilling to take the leap because of initial costs despite potential long-term benefits. “It surprises me, in general, what companies haven’t done yet in terms of mobility, like security,” Weldon said.